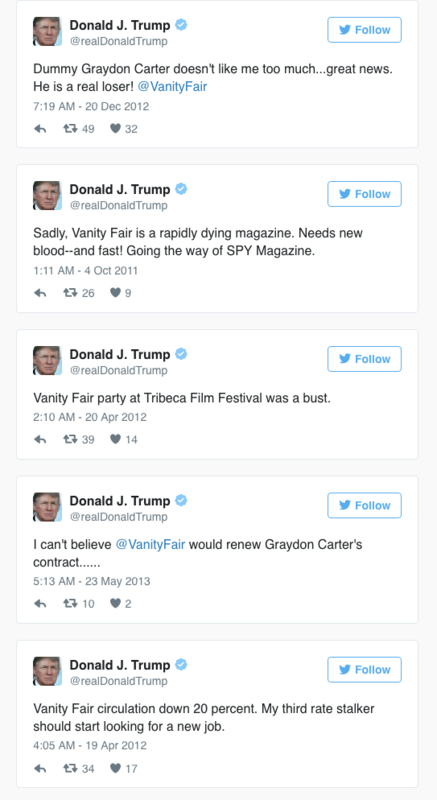 Donald Trump Tweets Vanity Fair Is "Dead" And Its Editor Has "No Talent"
Say what you like about the soon-to-be installed President of the US but his tweets border on the mad to the downright hilarious. Again, Donald Trump has decided to tweet his rage globally, this time taking aim at one of the most venerable of US publishing organs Vanity Fair. 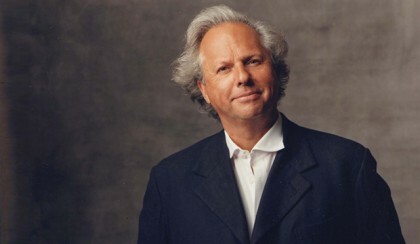 Trump was certainly unrestrained in his attack calling the title “dead” and labelling the editor, Graydon Carter (below), as having “no talent”. Trump and the magazine have had an ongoing Twitter war dating back as far as 2012 and that’s despite Trump appearing in the title on a number of occasions. Having said that, Vanity Fair took a decidedly pro-Clinton stance during the recent elections. Carter too is a co-founder of the now defunct Spy magazine that regularly lampooned Trump. It’s reported that Carter originated a joke about the size of Trump’s hands while Spy magazine regularly called him a “short-fingered vulgarian” in its pages.